Mathilda “Mattie” Marvelwood wants a normal life: friends, school, and a home in one place. Instead, the five Marvelwoods travel all year in a cramped caravan, making a living performing at carnivals, fairs, and circuses. 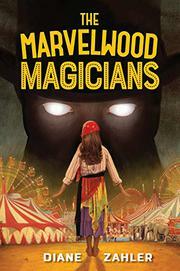 Each Marvelwood boasts a special talent: mom Maya is a fortuneteller; dad Simon is a master illusionist; 11-year-old Mattie is a mind reader; her 9-year-old brother, Bell, can disappear at will; and their sister, 4-year-old Tibby, can levitate. A big secret separates the Marvelwoods from other performers: their talents are real. After the family joins Master Morogh’s Circus of Wonders, Mattie discovers the shady ringmaster is stealing his performers’ talents. When he takes Bell’s and Maya’s powers, Mattie offers up what the ringmaster covets most: her mind-reading skills. Mattie doesn’t want her ability, anyway; she’s tired of being different, and Maya and Bell will get their powers back. However Mattie discovers life without mind reading isn’t as liberating as she thought it would be. Can she defeat Morogh and recover her talent? The close-knit family of diverse circus folk is the book’s highlight. Mattie’s da is from a Scottish Traveller clan, and Maya is Indian. There’s an Italian family of aerialists; a Sumatran tiger tamer; a quintet of Hungarian tumblers; and a dark-skinned tightrope walker.